The big brother of the S 45, this followed the same type of construction, with fine veneer covered ply sides and resin front and back panels. A four way speaker, the 2.5cm and 5cm dome tweeters were supplemented by a 12.5cm phase link unit and a large and impressive 25cm SEAS woofer. There were holes in the rear panel to allow wall mounting or the fitting of the very attractive stands. 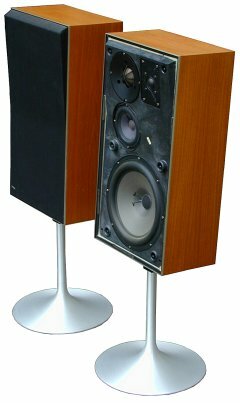 These speakers did not survive for very long in the range as the introduction of the Beomaster 4400 meant that slightly greater power handling was required. The very similar S 75 was thus its replacement. Text copyright © Beocentral. Unauthorised reproduction prohibited.